Oh man! Feeling out of practice with this whole blog post writing thing. Since starting a ketosis protocol a week and a couple days ago, that has pretty much been my life. Planning, cooking, yoga, and a general turning inwards. Pretty awesome actually. 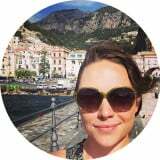 I’ve also been making and shooting a fair amount of recipes, but the blog post writing (also known as the piece of this project that always takes up the largest chunk of time and energy), has not made the to do list cut. BUUUT! 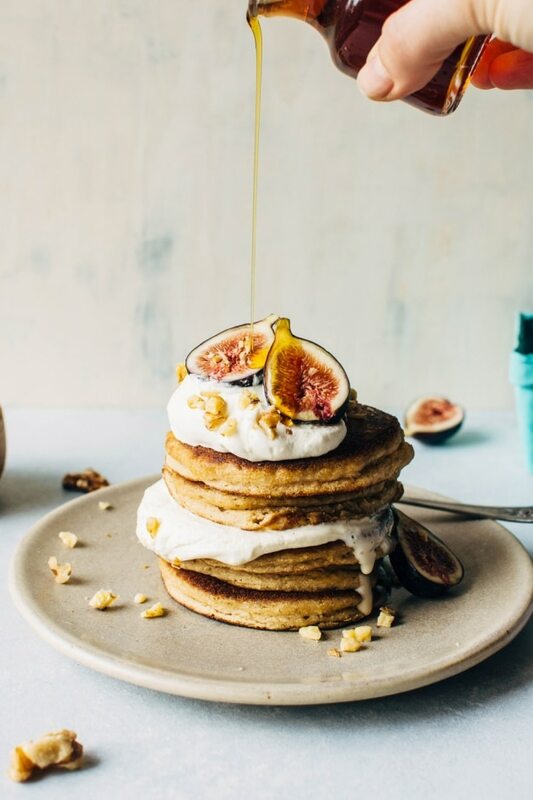 Fluffy grain free pancakes with fresh figs and whipped cream are just too damn good to keep from you guys any longer. So here we go. It may be a brief post (with maybe a few too many pictures – bc who doesn’t love a generous stack of pancakes piled high with all the good things) but it’s going to be a good one. I’ve always had a bit of a hard time with most paleo / grain free pancake recipes. They all seem to be too crumbly, too tough, flat, taste funny or just really don’t taste like pancakes AT ALL. Which if they don’t taste like pancakes, why even BOTHER. So I made my own recipe up with all the characteristics that are ever so important to me in a short stack. And since we’re friends I just know you’ll appreciate them, too. It wasn’t an easy job, working our way through one batch of pancakes to the next, until I got them just right. But I tell you now that we’re on the other side, it was SO worth it. Like my last post for grain free raspberry donuts, this recipe also uses a combination of several grain free + paleo friendly flours. Annoying, I know. Worth it? Abso-fricken-lutely. If you want to keep it simple and just use almond flour or coconut flour there’s a bunch of recipes out there for that style of pancake, but these my friends, are next level, and therefore require just a few next level ingredients. 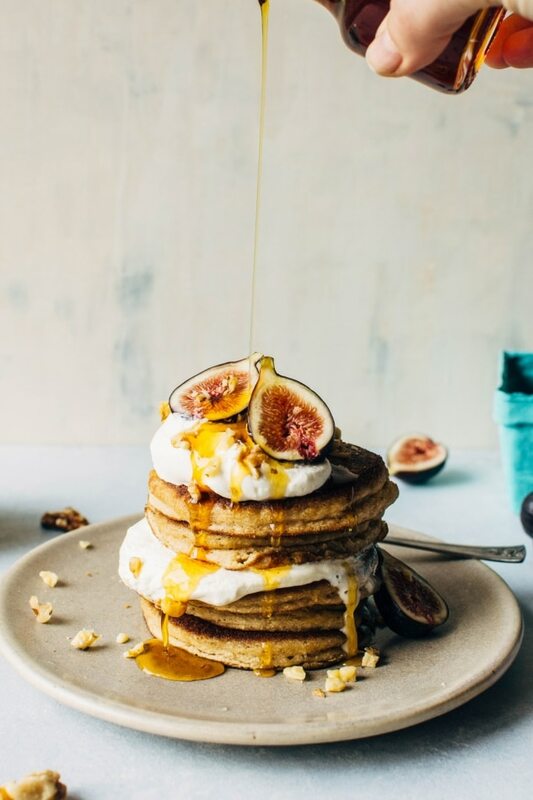 Top them with whatever kind of “whipped cream” makes you and your body happy – classic made with heavy whipping cream, the ever amazing dairy free coconut whipped cream, or whatever other concoction works for you, add some sliced fresh figs and crushed walnuts and you’ll be digging your fork into a weekend-worthy stack of these golden gems in NO TIME. 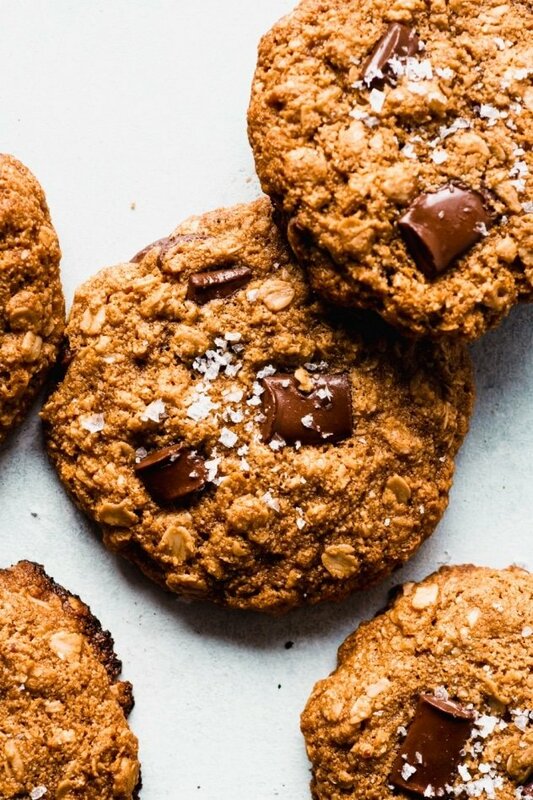 Want more easy and healthy grain free treat recipes? Check out these favorites! 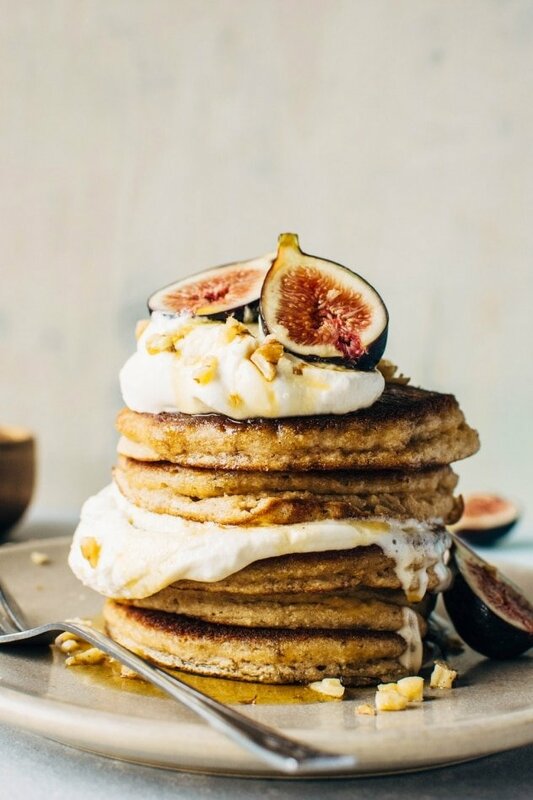 Fluffy grain free pancakes with fresh figs and whipped cream. 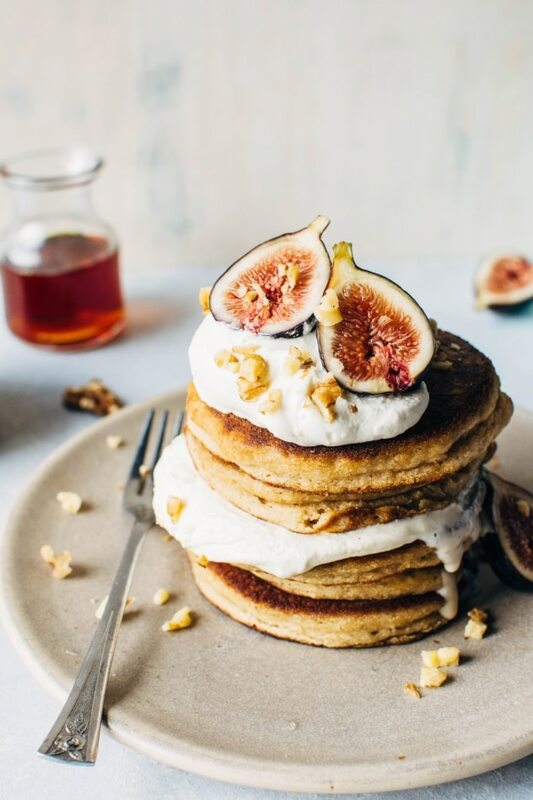 So fluffy, tender and crisp in all the right places – a literal grain free pancake dream come true. or pretty much whatever you like to eat with your pancakes! 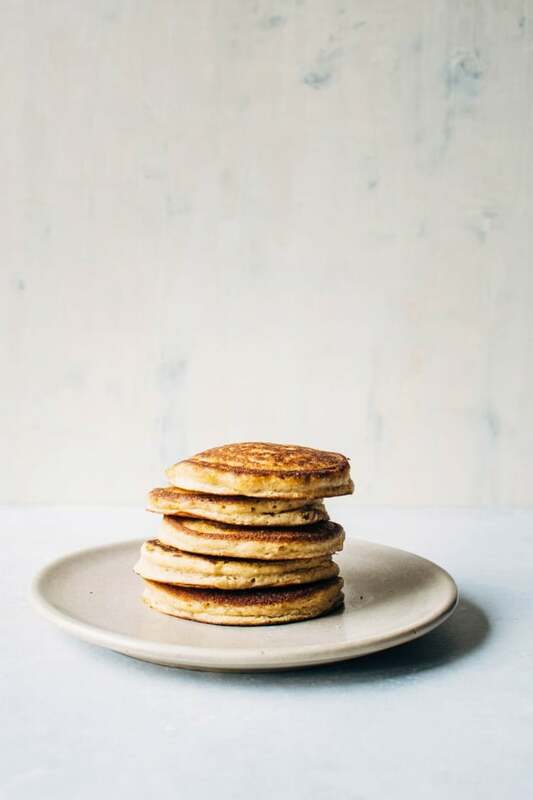 Preheat the oven to it’s lowest possible temperature – around 200 is great if you can – this will allow you to keep pancakes warm in between batches. In a large bowl whisk together coconut flour, tapioca flour, baking soda, sea salt, and cinnamon until well combined. 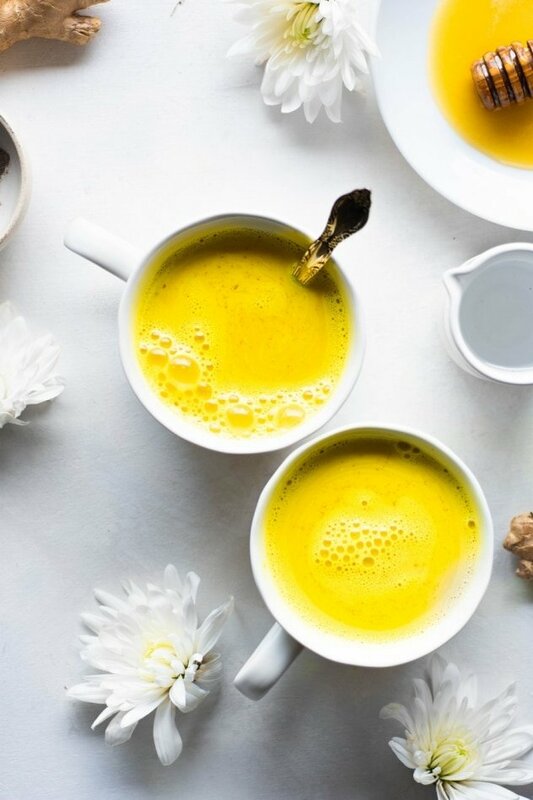 In a another bowl, whisk together eggs, yogurt, almond milk, maple syrup, melted ghee, vanilla extract, lemon juice and lemon zest. Whisk wet ingredients into the dry until smooth and allow to sit for 5 minutes before cooking. While batter is resting, heat skillet to just barely below medium heat. I found even a little higher than this setting and my pancakes would get too dark before they had a chance to cook through. You may have to play around with your stove top settings to get the temp just right. Add about 2 teaspoons of ghee or avocado oil to frying pan. 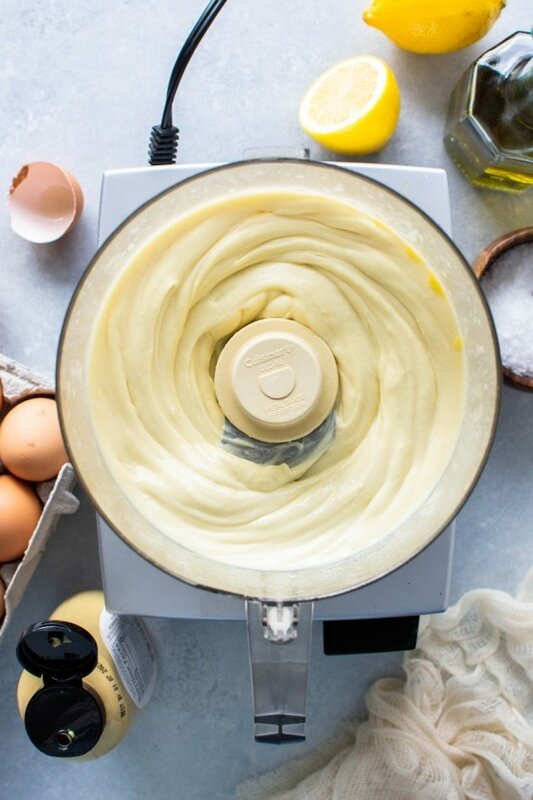 Scoop pancakes using a 1/4 cup measuring cup, and spread to a circle about 3 inches in diameter. Cook about 1 1/2 – 2 minutes on the first side, flip VERY carefully, and cook another 1 – 1 1/2 on the second side. When they’re golden on both sides and look sort of dry throughout they’re ready. Replenish ghee in between batches as necessary. Place finished pancakes in warm oven until they’re all cooked. 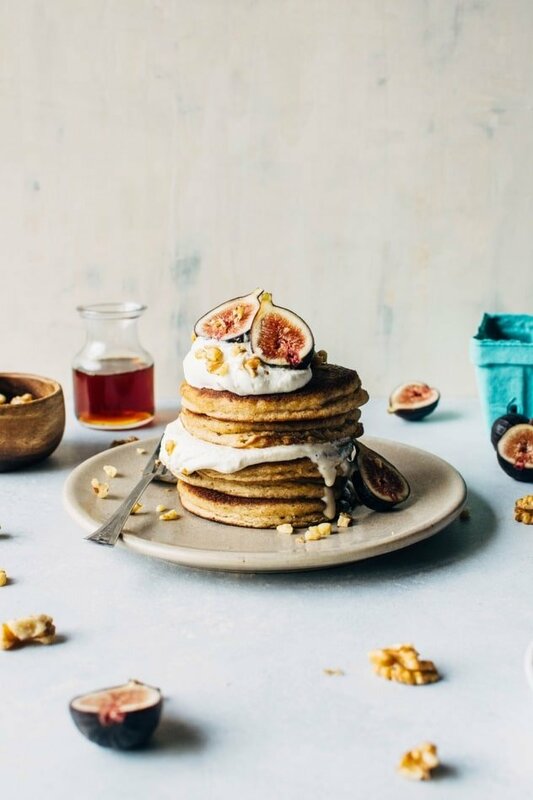 Top with whipped cream, figs and walnuts (or any other desired toppings) and DIG IN! I categorized these pancakes as “paleo friendly” because of the yogurt. I included it in the recipe because it adds an excellent rise to the pancakes and also a great flavor. I have successfully made them with almond milk yogurt – if you try another non-dairy yogurt I would love to hear how they turn out! 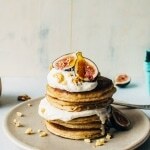 This entry was posted in breakfast and tagged breakfast, brunch, coconut flour, easy, figs, grain free, healthy, maple syrup, paleo, paleo friendly, pancakes, quick, tapioca, tapioca flour, walnuts on September 22, 2017 by Nyssa Tanner. 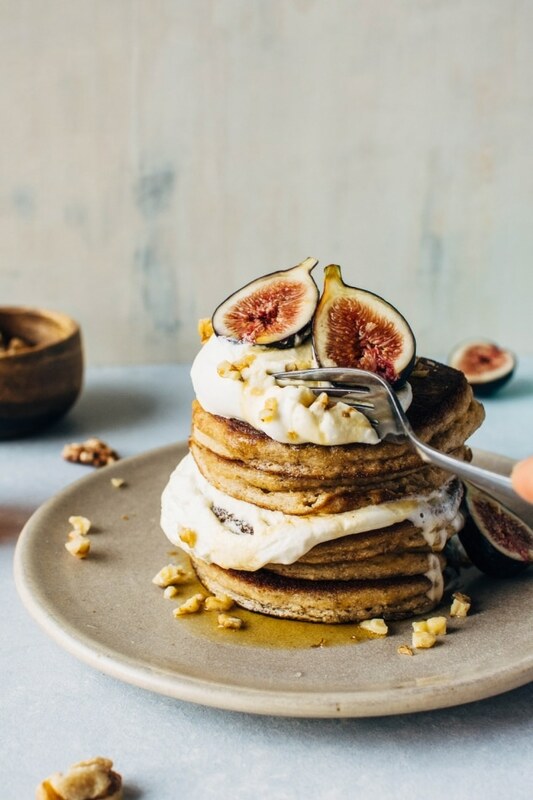 Those figs on the top make these pancakes just so gorgeous! 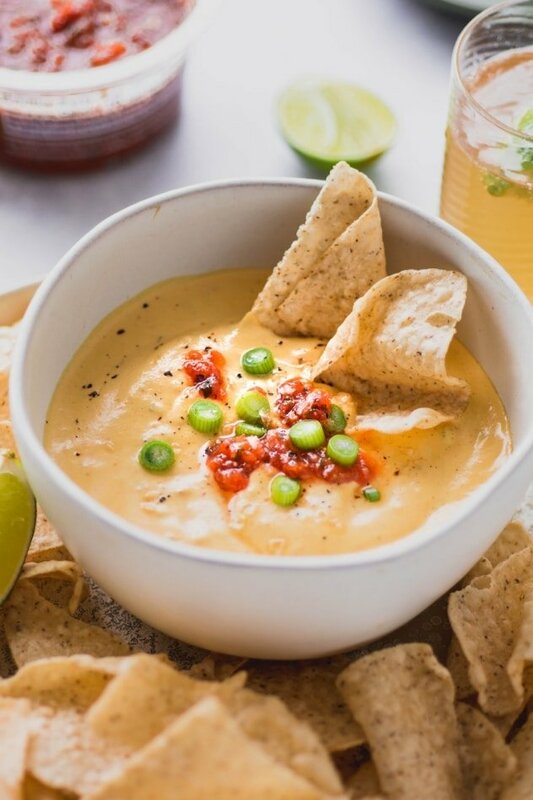 Well done, great recipe! The pancakes came out light and fluffy. They had a good sturdy structure, not at all crumbly or hard. Look delicious, and tasted even better. This where just what I was looking for. (Have several extra figs that I needed to use.) Also needed them to be gluten free, for a family member. We know the challenge of good and gluten free. But no problems with this recipe.